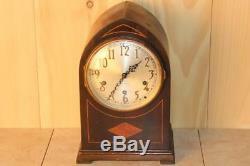 Antique Seth Thomas Beehive Style Westminster Chime Clock. This neat looking clock was made by the Seth Thomas Clock Company in Thomaston, Conn. USA just prior to the depression era. This model features a signed Seth Thomas #124 movement. It is in good running condition, keeping time and chiming properly. In case you are not familiar with Westminster Chimes, these are the ones that play a tune every 15 minutes; 4 notes on the quarter; 8 notes on the ½ hour; 12 notes at the ¾ hour; and then the full 16 note tune on the hour, followed by the hour toll, i. 1 toll at 1:00, 2 tolls at 2:00, etc. It has a nice old signed Seth Thomas silvered dial with applied brass numerals that is gently aged and shaded. The solid brass bezel and beveled glass crystal assembly is aged but also in overall nice shape. The case is in structurally good condition. The original finish is somewhat worn, but still nice looking. It measures 7 ¼" wide x 9 ¼" high x 5 ½ deep and comes complete with the pendulum and key. This helps insure that the new owner will have a satifying experience. Be very sure to save all packaging material if there is a problem. All sales are final, (with the exception noted below). It is nearly impossible to find one in "mint" condition. If a clock has damage from misuse, it will be noted. If a clock is running properly when it arrives... Thats about the best we can do. We try to describe everything exactly as it is and if we do something wrong, we will make it right. We do not use our computers on Sunday, the Lord's day, but will answer any emails Monday through Saturday and do whatever we can to resolve any problems. Honesty is always the best policy. The item "Antique Seth Thomas Beehive Style Westminster Chime Clock" is in sale since Friday, December 22, 2017. This item is in the category "Collectibles\Clocks\Antique (Pre-1930)\Shelf, Mantel". The seller is "saved400days" and is located in Port Leyden, New York.